An extraordinary couple embarks on a journey INTO the heart of AMERICA, starting in the water metropolis of Seattle and heading for the sacred Ancestors' Land on the arid Navajo Reservation. Showing a dramatic family portrait of a loving grandmother, Helen Yellowman--an enchanting traditional Navajo storyteller who refuses to speak English--and her adult grandson, Angelo Baca--a young academic who commutes between the two worlds--this road trip reveals an unknown America. As both navigate through America’s contradictions, nonetheless celebrating their strong connection to the homeland, it gradually comes to light: the Ancestors’ Lands are being desecrated. After being selected for the American Indian Film Festival in San Francisco, INTO AMERICA won Best Documentary Feature at the Das Nordamerika Film Festival in Stuttgart. Nadine Zacharias was born in 1982 in Wiesbaden and received an MA in Visual Anthropology at the University of Kent. 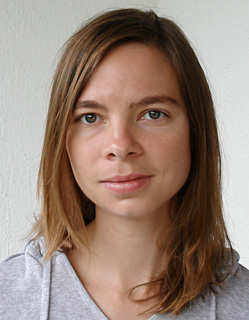 After directing various short films, Zacharias made her first feature-length documentary TAKTGEFÜHL in 2010.